The UN Dispute Tribunal cites “unlawfulness” in the Fund’s selection for a vacant D1 post; low investment performance continued in 2016; there are concerns about outside consultants, performance of the Pension Board Chair and Board members, including FAFICS, the UN retiree representative organization, and participant representative elections. Guterres must be firmly at the helm if our Fund is to correct course. General Assembly resolution 71/265, adopted on 23 December 2016, took to task the Pension Fund leadership on both sides (Secretariat and Investment Management Division, IMD) for serious managerial deficiencies (see link). The resolution calls for remedial action from the Secretary-General and the Fund leadership in order for the Fund to correct course. Five weeks after adoption of the resolution and almost a month since the Secretary-General took up his duties, has there been any progress? We've heard that the Chief Executive Officer of the Fund Secretariat, Sergio Arvizu, wants to restart staff-management consultations; but there’s no real sign that he's been chastened. We also know from publicly available documentation that low investment performance for 2014-2015 cited by the General Assembly continued in 2016 under the Representative of the Secretary-General for Investments, Carol Boykin. Recall that the problems highlighted in the resolution concern, on the Fund Secretariat side, unprecedented delays in pension payments to new retirees and survivors, and massive foreign exchange losses ($3.4 billion for the biennium 2014-2015) and low investment performance that places the Fund’s sustainability at risk, on the Investment side, among other issues. Two weeks ago the Fund CEO selected for the third time for a vacant D1 post of Chief of Technology, an auditor from the Office of Internal Oversight Services who reportedly for many years and until recently conducted audits of the Fund’s technology system. This decision was taken in the face of questions of conflict of interest, and despite admonitions from the UN Dispute Tribunal concerning the “unlawfulness” of the process. TheTribunal in both judgments reminded the CEO that “the UN is not a private corporation, and its posts are financed through public funds, which calls for transparency and accountability in the recruitment system” (paras. 42 and 49, respectively, in UNDT/NY/2016/024, and UNDT/NY/2016/073). An iSeek (UN Intranet) message posted on 23 January 2017 states that “on average the Fund can now process more than 1,000 cases a month…As of 1 January 2017 the Fund had an ‘opening balance’ of only 367 actionable separation cases to be processed [of which] most arrived at the Fund in the last week of December”. “44. There is doubt that the fund performed its role of secretary of the UN Staff Pension Committee, for which it is paid $21 million per biennium, in following up with UN organizations on incomplete paperwork. Given CCISUA’s report that OIOS found that the Fund had promulgated misleading information, on the payment backlog, we must consider that the latest iSeek message may also contain alternative facts. We're also told in the iSeek message that Member self-service is “on fire”. It's well and good for retirees already receiving steady pension payments to have better service. We’re glad, too, to note from the message that some time in March participants and beneficiaries will be able to access through Member Self-Service, information to monitor progress of their pension payments and make inquiries and receive responses by email. That still leaves the question of “non-actionable” cases of retirees, widows and orphans. How many ‘non-actionable’ cases, i.e, with incomplete documentation or other issues, are still pending, of which some have been languishing for a year and more? The GA resolution expresses "serious concern" at the continued delays "that may place beneficiaries and retirees, as well as their families, in difficult situations". How does the Fund spend the $21 million it receives from the GA every biennium to follow up on incomplete paperwork? What is the hidden cost in human suffering of these "non actionable" cases? There’s an end-to-end review of the payment process underway and reliable sources say that despite the GA resolution’s admonition in paragraph 29 of its resolution against the hiring of outside consultants (“emphasizes the need for the Pension Board ot ensure that the Fund takes appropriate measures to use existing internal capacities and avoid the use of consultants in its operations, as appropriate), the review is being carried out by outside consultants to the tune of $1 million plus dollars of our hard-earned savings. The picture on investment performance isn’t encouraging, or surprising. The GA resolution took the Fund to task for not meeting, in the 2014-2015 biennium, its 3.5 per cent target annual real rate of return and for incurring foreign exchange losses of $3.4 billion without a mitigating system in place (paras. 24 and 25) . Preliminary returns on investment were 5.03 per cent as of December 2016. Taking into account 2.1 per cent inflation for the year, this puts the IMD real return on investment at 2.93 per cent compared with its 3.5 per cent target. Note an article from Pension and Investments titled "Returns strong in 2016 despite scary beginning", which states that 2016 was an exceptionally good year for both US based and global funds. Average US based funds earned 6.7 per cent nominally and 4.6 per cent in real inflation adjusted terms The article includes this chart of global pension returns for 2016. (A link which requires sign-up and full text of article are provided below). A look at IMD’s monthly November 2016 report shows the Fund trailing its own policy benchmark by 1.78 per cent. Although the monthly report for December has not yet been posted, it’s highly unlikely that IMD could make up that much ground in a single month (see link). Consider that if IMD had simply followed the index it would have met its 3.5 per cent real rate of return target. So IMD has contributed what the Pension Board report terms "manager value added (negative effect)"(A/71/9, para. 161). Media sources report that investment performance of the Maryland state employee pension system for which the RSG was chief investment officer from 1999 to 2003 ranked in 2001 in last place in a national survey(see link to Baltimore Sun article). What actions have been taken since the GA resolution? Currently there’s no information on any progress that may have been made on the GA’s very serious observations and requests for action, including that the Secretary-General "entrust the Office of Internal Oversight Services with conducting a comprehensive audit of the Fund’s policies on, inter alia, risk management, investment management and other administrative processes” (paragraph 30 of the resolution). Will the OIOS audits include an investigation into the selection of the OIOS candidate for the vacant D1 post? Will the audits look into the selection, evaluation, and fees paid to external investment managers? Will the audits include what reliable sources refer to as IMD's "hospitality log"? The GA refers to its earlier resolution, 70/248, and notes that the Secretary-General’s report did not contain information on the RSG’s performance, and requests that this information be included in all his future reports (para.28). In this regard, is the RSG's contract up for renewal, and if so, has it been renewed? The Pension Board led by chairman, Vladimir Yossifov, at the Board’s annual meeting in Vienna muzzled our staff unions, chided and intimidated the press for writing about the problems at the Fund, and pushed for early renewal of the CEO's contract which ends in December 2017. What can be done to ensure a more responsible and accountable Pension Board? How can we ensure that Secretary-General representatives, G.A. and UN Agency representatives, and our retiree representative organization, the Federation of Associations of Former International Civil Servants (FAFICS), which holds six seats on the Board, act in an informed, responsible and accountable manner in representing our interests? The UN retiree representative organization, FAFICS, did not support our staff unions' efforts to uncover problems at the Fund. Instead, its president placed obstacles in the way of transparency and followed her own agenda, including attempting to block the OIOS audit of the payment backlog. 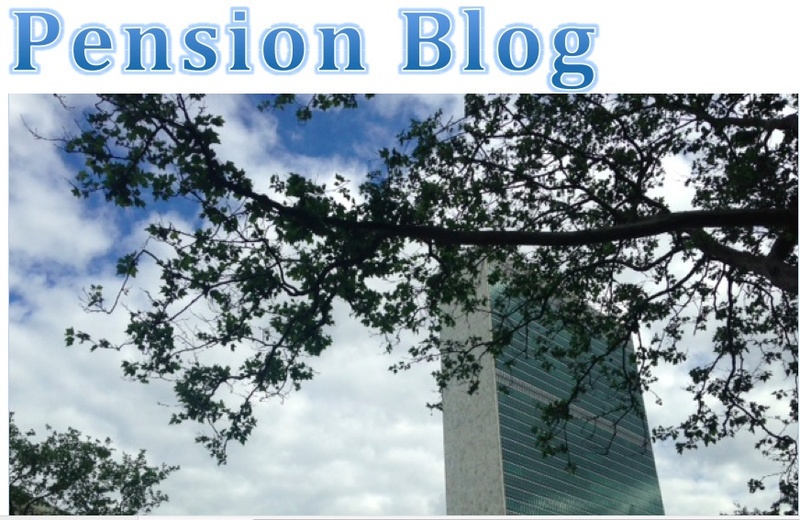 How do we ensure that elections for staff participants to the UN Pension Committee, whose terms expired at the end of 2016 (four reps and two alternates) are free and fair? The CEO as head of the Fund Secretariat holds the cards in terms of contacts with the entire body of Fund participants and beneficiaries, including 86,000 who are eligible to vote. Currently only two slots are occupied, an unacceptable situation that must be remedied by elections soonest. When the staff unions met with the Secretary-General on 9 January 2017 at his first townhall, they exhorted him as follows: “The fund’s staff work so hard. But its leadership stumbles from one mess to another. The General Assembly heard us and blocked the fund’s exit from the UN. We now count on you to change the fund’s leadership” (see link). Currently, there are more questions than answers. These are issues that are of crucial importance to the continued health of our Fund and must be resolved without further delay. This is not to say the iceberg is imminent or unavoidable. It’s to say that it would be imprudent to expect that the Fund managers who created the problems in the first place can be relied upon to correct course. Absent reliable representation, retirees must continue to support the staff unions in pushing for necessary changes and take whatever action we can ourselves. It is imperative and urgent that Secretary-General Guterres places his hands firmly on the helm in order to correct our Fund's course before it's too late. An eventful year filled with geopolitical drama, market volatility and diverging monetary policy gave rise to some impressive returns for pension funds in seven of the world's largest retirement markets. The average investment returns for pension funds in Australia, Canada, Japan, the Netherlands, Switzerland, the U.K. and the U.S. were higher in 2016 than the year before and ranged from the U.K.'s 20% to a 2.8% average for Japanese funds. The year started with a stock market crash in China and an increasingly accommodative monetary policy from the Bank of Japan, followed by the U.K.'s shock vote to leave the European Union. Commodity prices began to regain ground, and the year ended with the election of Donald Trump as U.S. president. But the volatility created by these events looks to have played to the advantage of pension funds, at least at first glance, said sources. The U.K. was by far the market with the highest average return, at an estimated 20%. That compares with a range of zero to 2% for 2015. Between June 24 and the end of the year, the pound sterling fell 17.05% against the dollar, while the FTSE All-Share index rose 5.52% in dollar terms. For the year, the pound dropped 16.26% vs. the dollar, while the FTSE All-Share gained 16.75% in dollar terms. U.K. pension funds that had little or no currency hedge on their overseas assets will have reaped richest benefits of currency moves. But “almost all schemes will have benefited to some extent,” Mr. Edwards said. Allocations to growth fixed-income assets such as local currency emerging market debt and high-yield bonds “will have seen decent returns from that part of the portfolio,” he said. However, there is a counterpoint to the stellar returns for U.K. pension funds: A drop in gilt yields after the Brexit vote has pushed liabilities up. Mr. Edwards estimated liabilities are probably up around 20% to 25% for the year. “Even though assets rose over the course (of 2016), with strong returns overall, funding levels will have moved much less than that as liability valuations” also were up. Little movement in funded levels was also a theme in the Netherlands, said Mercer principals and investment consultants Edward Krijgsman and Dennis van Ek, both based in Amstelveen. Pension funds started the year 102% funded, and finished at the same level. “However, the 102% we started with went below 95% in March but recovered,” said Mr. Krijgsman. A decrease in interest rates in 2016, pushing fixed-income allocations into positive performance, was beneficial to Dutch pension funds but did harm funding levels. Mr. Krijgsman said these funds have a relatively high interest rate hedge, around 40% of the market rate of liabilities. Messrs. Krijgsman and van Ek put the average pension fund return at 7.3% vs. 1.1% in 2015. “That lies very close to the performance of the average Dutch pension fund on their fixed-income portfolio, about 6.8%,” said Mr. Krijgsman. Equities also performed well, with the MSCI Europe index gaining 3.1% in dollar terms. An average 50% currency hedge will also have helped bolster returns, as the euro fell about 3% against the dollar. Executives at Mercer have and will be encouraging clients to look carefully at their currency hedges going forward. “We don't favor 100% hedges on all currencies, or any one hedge. The U.S. dollar can offer some favorable (advantages) when there is a problem in the eurozone,” said Mr. van Ek. And with important elections coming up in European countries and ongoing accommodative monetary policy, “even with the unrest in the U.S. with (Mr.) Trump, we see certain exposure may be desirable, simply from a risk strategy,” he added. However, the fall in sterling makes that currency less attractive, and “it would be wise to have a large hedge on that,” he said. Australian pension funds came next in the ranking, with an average 7.2% return, up from 5.6% a year earlier, showed data from SuperRatings Pty Ltd. The so-called Santa rally in December contributed 2.1% to overall returns, and the Australian dollar fell 1.1% against the U.S. dollar. The Australia stock market, the ASX 200, also gained 11.79% in 2016 in U.S. dollar terms. U.S. pension funds clearly benefited from the strong U.S. dollar, and returns reached 6.7% according to Willis Towers Watson PLC. That compares with -0.8% for 2015. Last year was a “pretty good year for equities,” said Alan Glickstein, a senior consultant at Willis Towers Watson in Dallas. The Russell 3000 gained 12.74% over the year. That would have benefited U.S. funds, which had an average 63% allocation to domestic equities at year-end 2015. But it was not all clear sailing. The funded status of the average plan hovered around 80%. Also noteworthy is “how dramatically different things would have been if we ended the year the day before our elections,” Mr. Glickstein said, referring to the Nov. 8 U.S. presidential election. “Things would have been much worse,” with a funded status probably around 75% or a little less, the lowest level Willis Towers Watson has seen in its analysis. Equities were not performing as well, and rates were much lower. “Immediately after (the election) liabilities dropped a bit and equities were up. So that sort of saved us from what would have been an ugly year from a funded perspective, to one that looks pretty flat,” added Mr. Glickstein. Moving north, Canadian pension fund returns came next, with an estimated 6.5% return on the typical 60-40 portfolio, said Bruce Curwood, director, investment strategy at Russell Investments Canada in Toronto. While volatility hit global markets, Canadian plans fared well based on three major, interrelated issues: rebounds in material and energy prices; a resulting 21.08% gain in U.S. dollar terms for the Canadian stock market, the S&P/ TSX; and increased Canadian bond yields. “Even with a soft economy, subdued domestic growth and low inflation, Canadian bond yields increased across the board this past year, decreasing pension liabilities, yet still managing to provide a positive investment return” of 1.7% for the FTSE TMX Universe in Canadian dollar terms, said Mr. Curwood. Last year “was almost a complete reversal from the poor year Canada experienced in 2015 for commodities, the Canadian stock market and domestic Canadian interest rates,” he added. He said Canadian funds will have “gained ground in their fight for 100% solvency funding,” as rising interest rates decreased liabilities, while assets increased in value. Swiss pension funds also made a marked improvement on their 2015 returns, hitting an estimated 4.2% vs. 0.7% a year previous, estimated Daniel Blatter, senior analyst at WTW in Zurich. Pension funds made small shifts out of bonds in favor of alternatives and real estate, and equities saw a small increase in terms of the proportion of overseas exposure. “The key driver of decisions on investment strategy in 2016 has been the low/negative interest rate environment with Swiss government bond yields below zero for much of the curve,” Mr. Blatter said. The final pension fund market analyzed by Pensions & Investments was Japan, with an average 2.8% return for Russell Investments' universe of corporate pension funds. That compares with a less than 2% estimate for 2015. Fixed income was also a focus for pension fund executives, thanks to the unexpected introduction in January of a negative interest rate by Haruhiko Kuroda, governor of the Bank of Japan. “As a result, the yield of the 10-year JGB became negative, and dealing with domestic fixed income became the most interesting topic in 2016,” said Konosuke Kita, director of consulting at Russell Investments in Tokyo. Investors moved out of Japanese fixed income and into assets such as hedged international fixed income and alternatives, or took steps to control the risk level in Japanese fixed income, he said. This article originally appeared in the January 23, 2017 print issue as, "Returns strong in 2016 despite scary beginning". Many thanks, Loraine, for keeping us informed. Thank you for this very detailed article. Is the SG being informed about all these PF issues? Is there a serious representation for retirees and, most important, their surviving spouses and eventually children?